Looking for great waiter, waitress, and waitstaff uniforms online? 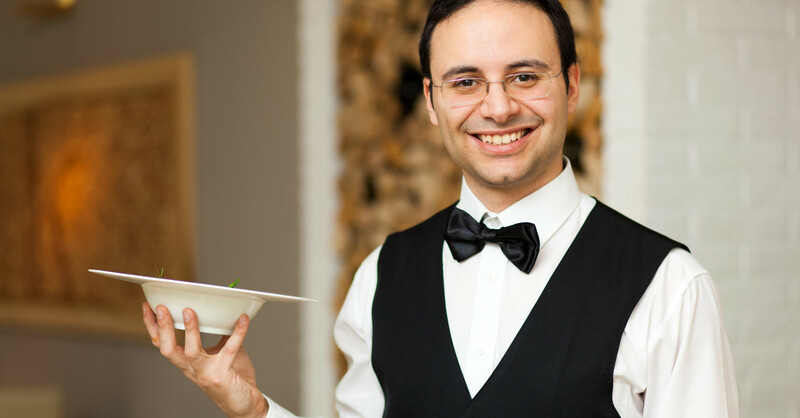 We have an excellent selection of uniforms for all types of waitstaff – waiters, waitress, and others who help serve your customers such as all types of serving staff uniforms, including maître d’hôtel, head waiter, host / hostess uniforms. Choosing quality, good-looking and cost-effective uniforms for your serving staff can be a daunting task. We offer some options. First, browse our website for featured products and ideas. Second, click over to our online store, browse, and order a sample. And third, reach out to speak with a “uniform idea consultant,” and we’ll create a free custom quote for you and your restaurant. Your waitstaff will soon look better than ever! Commonly people search for “waiter uniforms” or “waiter uniforms online” or, if the staff tends to be female, “waitress uniforms.” However, let us give you some advice – it’s not just for the men, or the women, it’s for both, and – indeed – you want all your wait staff to look good – from the cooks, the to greeters, to the busboys and busgals, and of course to the waiters and waitresses. Reach out to one of our “employee uniform idea consultants” and let us brainstorm the best-looking waiter and waitress uniforms you can desire. Just call 800-223-8550 for immediate service. We’re happy to help generate wait staff uniform ideas! Browse one of our on line catalogs and request a sample for evaluation. Shirts are the focal point of an employee uniform. Imagine your staff in the color of your choosing, with your company logo, all dressed in a quality shirt. Quality shirts make both your employees and customers feel great. Aprons, of course, are the workhorse of restaurant uniforms. But even the workhorse should look great! Imagine your staff in the color of your choosing, with your company logo, all dressed in a quality apron. This sets the stage for not just uniformity but quality in your wait and kitchen staff uniforms. Uniform vests are a staple for restaurants, hotels and casinos particularly for the waiter, bartender, dealer or front desk. We offer matching male and female styles that blend well with the shirts and blouses that your staff current wears. Our accessories pull your look together. Accentuate your look with our best accessories such as ties, bow ties, scarves, suspenders, cummerbunds, button covers and more.